ePublishing Knowledge BaseePublishing Knowledge BaseePublishing Knowledge Base Creating Pages & Site NavigationHow do I create a redirect? 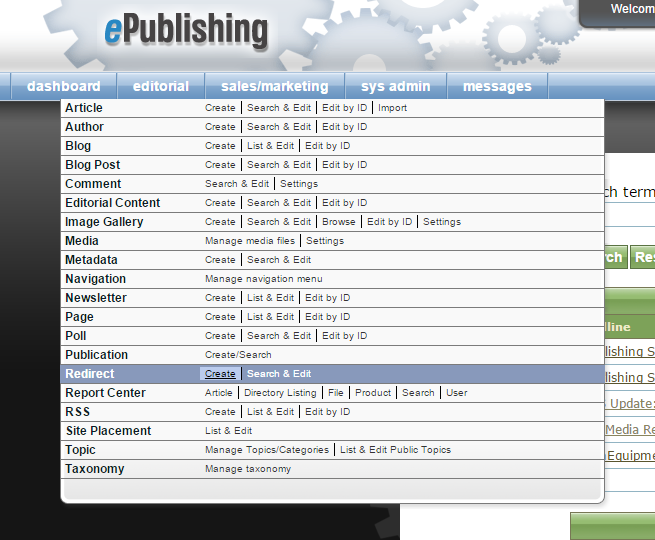 The ePublishing redirect tool lets you create and manage redirects within the site and externally. Redirects are often used for SEO friendliness and maintaining good links throughout the site. Create a 302 redirect, which should only be used in limited circumstances. All redirects are instantly available upon creation. Internal redirects are used to create search engine-friendly URLs. They can also be used to create catchy or shorter and easy-to-remember URLs for promotions. There is no limit to the number of redirects you can create. Using a specific URL - domain.com/new-book-2015 - for a marketing campaign, allowing for more effective tracking in Google Analytics. Creating a landing page for keyword campaigns on Google AdWords. For example, you could use domain.com/fluffy-bunny, which would point to a keyword landing page or taxonomy landing page for fluffy bunny. Creating a quick access link to popular site functions. For example, you may create a redirect for your subscription page: domain.com/subscribe. 1.1. Select the Create link next to Redirect from the main navigation in your dashboard. You may also edit existing redirects by clicking Search & Edit. 1.2. Ensure Redirect type is set to Internal. Zoom: Ensure Redirect type is set to Internal. 1.3. In the From field, enter your new friendly URL redirect. Zoom: In the From field, enter your new friendly URL redirect. 1.4. In the To field, enter the URL you'd like to point the redirect to. This link must be an existing URL on your website. Zoom: In the To field, enter the URL you'd like to point the redirect to. This link must be an existing URL on your website. Upon clicking Create, the redirect is ready to go and the action options change to Save, Delete or Reset. Use Save if you change the redirect. To Delete a redirect, click Delete. Internal redirects will be the most common redirects you will use on your website. The 301/302 redirects are used for those domains and/or subdomains that are specifically pointed to the publisher’s site domain for handling. For example, the redirect tool will not redirect traffic from a competing site to a specific site page within a given site unless the competing site owner has pointed the domain for the competing site to match the publisher’s domain. 301 redirects are used for directing users to pages that have been removed or demoted from a site’s original design. NOTE: 302 redirects should almost never be used. They are generally ignored by search engines and could result in important pages being removed from large search engine results. 302 redirects are used to temporarily point users to a new location. 2.1. In the Redirect Manager, select the type of redirect you'd like to create: 301 or 302. Zoom: In the Redirect Manager, select the type of redirect you'd like to create: 301 or 302. 2.2. Enter the required fields. Zoom: Enter the required fields. In the From field, enter the external domain/subdomain link. The To field is for the URL a user enters into his browser to get to a specific page. This URL has a domain name and/or subdomain name that is not the same as the domain for the publication. Example: A site user wants to direct users who try to go to http://counties.ibj.com/hamilton/ to a page within the ibj.com site. As the site owner, the admin enters the external domain/subdomain link (the former) into the From field. 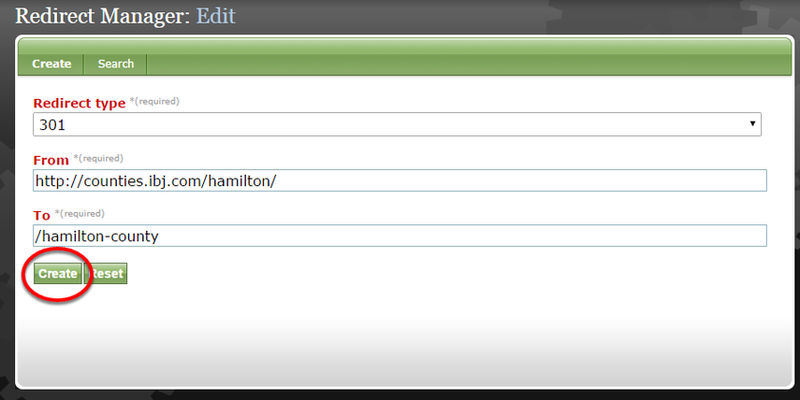 The admin will enter the specific page within the site in the To field: /hamilton-county. When a redirect is successfully created, a yellow banner will appear. Zoom: When a redirect is successfully created, a yellow banner will appear. Prev: How do I change or update the navigation on my website? Next: How do I create a landing page that includes content from multiple topics based on taxonomy?